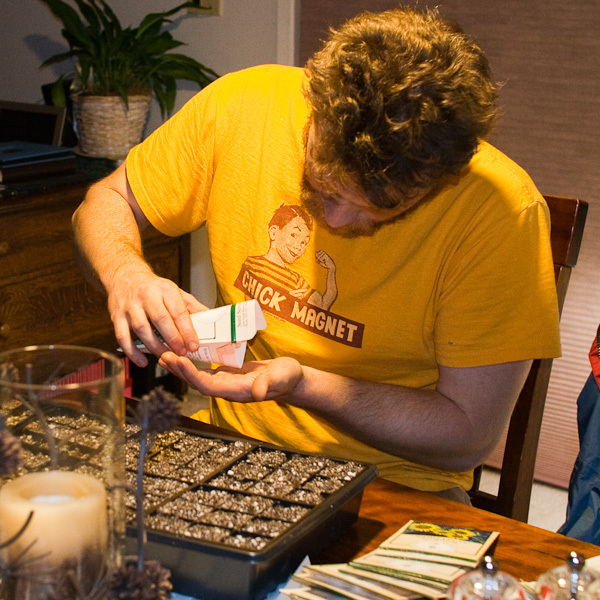 After splitting a major seed purchase with Alicia, I have a lot of new varieties to grow this year! I am most excited about the new Heirloom Tomato varieties, the Runner Beans which should have brighlty colored flowers and yummy beans, and I am excited to grow broccolli for the first time. I’m also enthusiastic to grow Chard and Tomatillos for the first time, and find out what to make with them. We are also talking about trying a potato variety in one of our raised beds, which will also be something new and interesting. 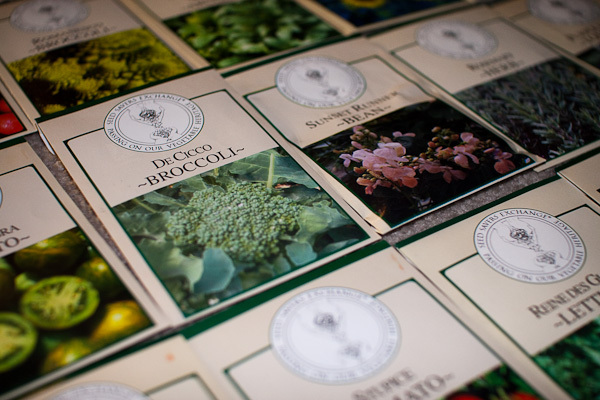 Just a few of the new seed varieties that we ordered. I’m especially excitedto grow things which are new. My approach this year is to start seeds in a 72-seed starter tray, then transplant them into 4″ square pots as they outgrow the starter tray. The starter trays are placed on a heat mat to raise the temperature by about 10 degrees from the temperature of the room. They are covered with a clear humidity dome, andI am watering them by filling the tray with water and allowing it to soak up from below. This doesn’t displace the seeds as watering from the top often does. Starting with the second starter tray, I used a blend of compost, peat moss and perlite as my planting medium (The mix was sifted through hardware cloth to ensure that it was well broken up and debris-free. Planting seeds into 72-cell starter trays. Thus far, I have started 3.5 trays. I did the first tray in Jiffy peat pods with lettuces, tomatoes, basil, peppers, a few leeks, and some eggplant. The Second tray was filled with young onions (18 Leeks, 18 Shallots, 18 green onions and 18 Walla Walla onions). the third tray was filled only half way, with 3×3 blocks dedicated to Carrots, spinach and more. The last tray contains the newest additions from this large order from Seed Savers, including my Broccolli (which germinated in only 2 days), heirloom tomatoes, additional pepper varieties, rosemary and sage. I have found that Peppers and Eggplants germinate extremely slowly (3 weeks), tomatoes take about a week, and broccolli takes only a couple days. Yay seeds! I can’t wait to have fresh vegetables around the house again!